Two international-class orchestras came to Carnegie Hall within two weeks of each other, performing under the capable batons of highly (and deservedly) acclaimed conductors. The Budapest Festival Orchestra (Feb. 18) led by their co-founder Iván Fischer presented a fascinating program – Weber’s overture to Der Freischütz, Liszt’s Piano Concerto No. 1 and Prokofiev’s Fifth Symphony. The Weber, a harbinger of the Romantic style that came to dominate 19th-century German culture, was played with warmth and strength; Fischer drew powerful climaxes and sensitive lyricism, recreating the mysterious mysticism of the opera’s key scenes. The clarinet part emerged with great beauty, as did all of the wind section throughout the concert. After the Liszt concerto, Prokofiev’s Fifth closed the program with its melodic richness, eruptions of triumph in the brass, and biting unanimity in the strings. A “war symphony” celebrating the Soviet victory over the Nazi invaders, with outer movements of menace, flaming passion and weighty Adagios, it was all wonderfully brought out by Fischer’s knowing podium presence. He also gave their due to the parts of the score tinged with little bursts of the irony that defined so much of Prokofiev’s music. In between those opening and closing works came the Liszt Concerto played by Marc-André Hamelin, a virtuoso seen all too rarely in New York. If the Weber and Prokofiev pieces were greeted by the audience with warm, enthusiastic approval, Hamelin’s brilliance clearly led the audience to the kind of exciting, electric charge that mirrored his superb performance. Beginning with a full-toned burst of energy, his control of all aspects of the work was a lesson in bravura style. Every note sounded inevitable, from imperious climaxes to the amazing, butterfly weightlessness of the deeply felt Adagio section. Surely, a memorable performance, one that stands with the greatest Liszt performances I’ve ever heard. But it was matched weeks later when the Minnesota Orchestra came to Carnegie in an all-Sibelius program (Mar. 3). This is an orchestra whose glorious past was established by such idols of the podium as Eugene Ormandy, Dimitri Mitropoulos and Antal Doráti, among others. The current music director, Osmo Vänskä, a native Finn, has Sibelius in his DNA and it showed in his marvelous performance of Sibelius’ Third Symphony. The two symphonies that preceded the Third reflected influences of Russian music, but the Third broke new ground. No one thinks of dance music when it comes to the dour Finnish composer, but the Third is full of melodies informed by syncopated rhythms and lilting swing, emulated by Vänskä on the podium where his tall, thin figure and long arms smoothly drew an exciting performance from the orchestra. Sibelius also wrote well for the woodwinds and the clarinet was prominent at times, but the blended woodwind chorale still comes as a surprise in a genre where chorales are usually the territory of the brass instruments. But we were talking of virtuosity that matched Hamelin’s. It came from violinist Hilary Hahn, who did her own dance alongside the conductor’s, swirling lightly between the podium and the first desk violins, demonstrating that she was wholly consumed by the passionate Violin Concerto. By now it’s a fixture of many top violinists’ repertories. I’ve heard it in many concerts and recordings, but never before played with such intensity. The opening melody emerged as a tightly wound climb to the heights, and at the other end of the scale, Hahn’s lower notes were warm, broad pools of sound that drew the listener into the work. Vänskä’s impeccable accompaniment was also worthy of praise as it formed the dark context of a bright work. 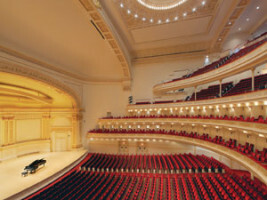 Carnegie Hall’s famous acoustics brought out the inner details of the playing of both orchestras and soloists. And after Hahn’s brilliant performance, the house went wild. I know that these days audiences tend to applaud almost anything that happens on stage, but this one had the kind of instant appreciation artists live for.